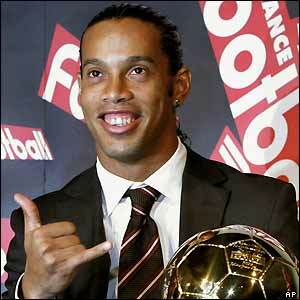 Ronaldinho has just won the Ballon d’Or bestowed by France Football. Essentially, Ronaldinho is the best football player in Europe according to journalists. 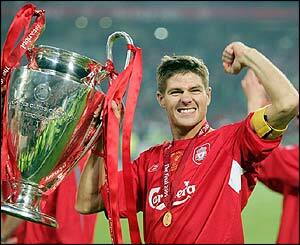 Like all football maniacs, I agree with that decision even though I wanted Liverpool’s captain, Steven Gerrard, to win after his heroics during last Champions League. Ronaldinho from Barcelona, Juninho from Lyon and Henry from Arsenal. Cech from the Czech Republic, Maldini from Italy and Shevchenko from Ukraine. Italy wins and Milan won UCL italy reigns!! England maybe but Brazil no they use to be good but now they have gone down.Next world cup campiones de mundo will be Portugal vs. Spain and Portugal will win. I thought Van nisterooy is good? Attack:Drogba , Ronaldinho , Eto’o , Messi. Middlefilder:Kaka , Gerard , C.Ronaldo , c.Fabregas , F.Riberyy. Goaalkeper:I.Casilas , Buffon , P.Cheh , Dida . Goalkeepers : Frei . Buffon . Casilas . I’m really sorry for you Avinash that your conclusion was Brazil vs England for the World Cup Final. Expect the unexpected. Don’t rely on what people say, on the media and even what you think. Cause you cannot win all the time in football. As you have seen recently Netherlands got a beating with Russia (3-1). Holland were the most favorite, but they lost. As it concerns the World Cup 2006, in case you forgot, Italia won it – dominate doesn’t mean win. sulmues ..RONALDINHO .PATO. KAKA .INZAGHI.HENRY .PAVLIQENKO. were are kaka and c.ronaldo and buffon and ramos ?